What happened between paragraphs? Many designers use an em space to begin a new paragraph. Other designers feel that a space the width of a letter “M” is not enough, and others would use less space, not more. One of the first books I designed was with the artist Leonard Baskin, who insisted on half an em space. A journal editor with whom I worked was uncomfortable with 1 em and wanted 3 ems. We compromised on 2. In Questioning Edmond Jabes, the designer, Richard Eckersley, used what he called “outdents” — hanging indents with the first line of each paragraph flush left and the rest of paragraph indented. 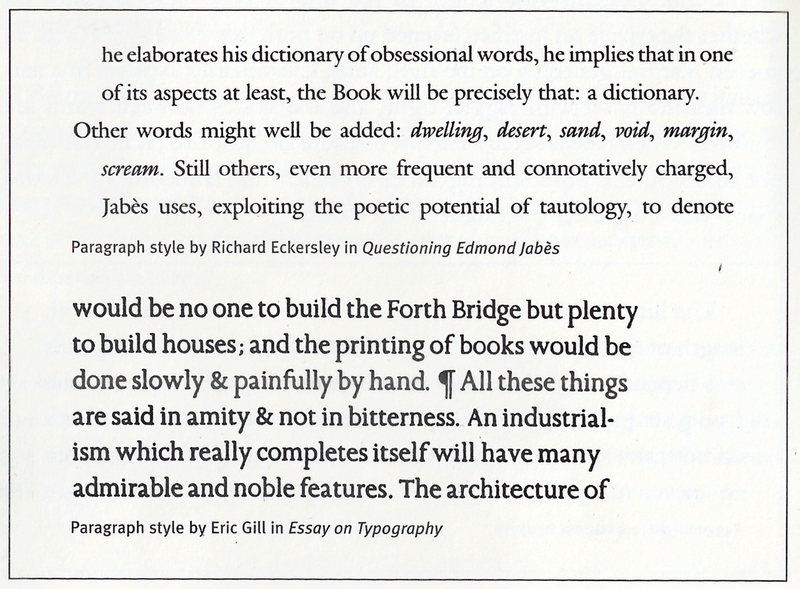 Eric Gill’s Essay on Typography has no paragraph indents but instead uses the symbol ¶ (known as a pilcrow). Other designers use no indentations but prefer space between paragraphs. Jan Tschichold wrote an entire essay on why paragraphs must be indented: because indention guarantees that no reader will miss the beginning of a paragraph and because it does not compromise the design. Spaces between paragraphs are “flagrant interruptions and at times leave the reader in doubt whenever a new page indeed begins with a new paragraph.” Tschichold also felt that a lack of indention compromised the text. Flush-left paragraph beginnings give the reader the impression that everything on the page is connected.. that he is reading a single paragraph. Yet a good writer chooses his paragraph breaks with great forethought and wants them to be recognized as such… While blunt beginnings seems to create a uniform and consistent impression when compared with normal typesetting, this impression is paid for with serious loss of comprehension.